Waffles just got even tastier by adding some Nutella in to the mix before cooking. This recipe uses our healthier homemade Nutella too and with using oat flour to make the waffles, this is the perfect Sunday morning breakfast that tastes more indulgent than it is. Place the oats in a blender and blend until it makes a powder. Put in a large bowl and add the baking powder and cinnamon. Put the banana, egg, milk and melted Nutella in a blender and blend until smooth. Add the wet liquid to the oat flour and mix until smooth. Grease your waffle maker and using a ladle, add the mixture to your heated waffle maker (it should make 4 waffles depending on the size of your waffle maker), close the lid and cook according to the instructions of your waffle maker. These take around 5 minutes in our waffle maker. 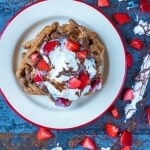 Serve hot with Greek yoghurt, Nutella and strawberries on top.